“A Marriage Covenant: Not For Women Only” from Christian Faith Publishing author Linda Anderson explores marriage from the perspective of those who originally wrote the Bible. Only by understanding Biblical teachings through the lens of the ancient Hebrew culture can serious students of the Bible truly understand what is being said. “A Marriage Covenant: Not For Women Only”: a look at the Biblical teachings on marriage from the perspective of the ancient Hebrew culture. 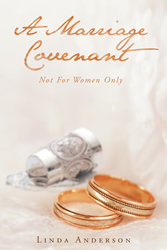 “A Marriage Covenant: Not For Women Only” is the creation of published author, Linda Anderson. Linda Anderson has spent the last twenty or more years pursing her passion for the Covenant, ancient Jewish wedding customs, and Biblical teachings from the Hebraic perspective. Since leaving a career as a certified operating room nurse, Linda and her husband enjoy spending warm days with her two daughters and their families. Published by Christian Faith Publishing, Linda Anderson’s new book revisits Biblical teachings on marriage from the original Hebrew perspective. To truly understand the Word of God, one must learn to see the Scripture through the Jewish mindset. Jesus was Jewish. The majority of his audience and the majority of the authors who wrote the Bible were Jewish. The Jewish culture of that time is far different from the modern cultures of most Christians. Christians must, therefore, attempt to learn what Jesus Christ and writers of the Word actual meant when they penned their words. View a synopsis of “A Marriage Covenant: Not For Women Only” on YouTube. Consumers can purchase “A Marriage Covenant: Not For Women Only” at traditional brick & mortar bookstores, or online at Amazon.com, Apple iTunes store, Kobo or Barnes and Noble. For additional information or inquiries about “A Marriage Covenant: Not For Women Only”, contact the Christian Faith Publishing media department at 866-554-0919.